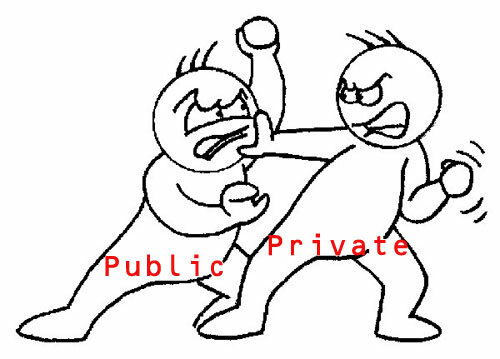 In India there’s always a fight between the Private and Public players, especially in the Telecom Sector. Here the public sectors with their low cost plans tried to rope in customers but to their disappointment could not manage to do so, at least in the urban areas. Though the public operators may be having huge number of users, they fail to keep up to the pace of the changing trends. Just check out MTNL’s site. One would not be interested to see such a site. The interface and the look is not attractive as compared to the high end sites being made by private players such as Vodafone and Airtel. Though Public players try and pull up their socks to stay in the race, they still lag behind in providing the peripheral or supplementary services, which are demanded by users today. Let’s take a simple example of the Bill Assist, which is provided by Airtel as well as MTNL. This service assists you to chose a plan according to the number of minutes you speak every month, the end objective being to provide you a plan that could give you value for money. Airtel has a flash enabled service on its site, called as Tariff Calculator. It allows you to adjust the calls and SMS levels according to your usage and thus giving you an expected bill you would get if you were using Airtel. But this one calculates your bill only on the Rs. 299 plan and thus would not give you the best solution. On the other side we have public giant MTNL with its “Click Here” concept. Here what MTNL does is puts a link named Financial Implications of Dolphin and Trump Services and then once you click on it, you would be asked if you want to save a file. This file is a Microsoft Excel sheet, which provides you excellent information by having each plan listed and providing you with the expected bill amount if you have varied calling time. Each plan thus can be analyzed separately and depending on how many minutes you use, you could get a clear cut idea and this is where MTNL would have an upper hand over Airtel. We just want to say that even though Airtel’s Tariff Calculator would be comparatively less effective than the MTNL Excel Sheet, it’s all about the way the user is handed over the service, thus making the better looking Airtel Calculator the preferred choice. But in terms of effectiveness, MTNL would be the winner. We would like to request MTNL to have a thought given to its web site and also the whole service.